The eme system has had a bad time during a few storms this winter. I am planning to replace it by my old head unit which was in a tower a few years ago. I have to build a small tower from about two meters to put the head unit on. The big advantage is that there is already a motor with a chain on it. So I do not need an rotator. I have to modify the elevation part because I was not able to elevate to 90 degrees wit that system. 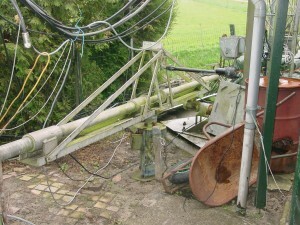 When the canal next to the house is closed then I will move the eme system there. I will be as low above the ground as possible. This is not possible on the position where it is now. I have put the old head unit out of the mud to rebuild and paint it.